No, you didn't see this same critter in the post from two days ago. This is the Greater Yellowlegs. Although the Greater and the Lesser Yellowlegs appear very similar to each other, they are not closely related. 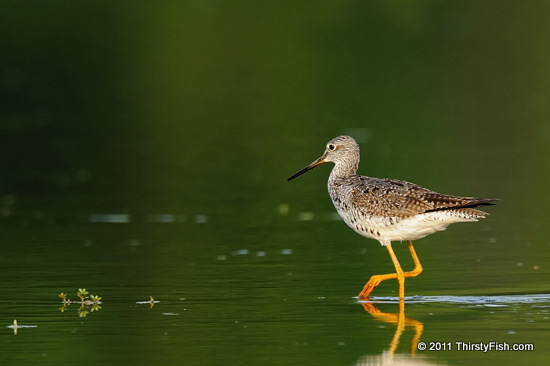 When seen together, the Greater Yellowlegs is distinctly larger and has a longer bill. Estimates suggest that the Greater Yellowlegs population is about one tenth of the Lesser, but both species are believed to have stable populations. The Greater Yellowlegs is also known as Tell-tale Godwit or Snipe. Before their protection by the Migratory Bird Treaty Act of 1918, they would foil hunters by their "tell-tale", piercing alarm calls. Hunters would leave them alone for more desirable birds.